Dimensions 2 by 6 by 9 in. Conflict of laws; Commercial law. Amazon.com description: Product Description: When the first edition of this student work was published some eight years ago transnational commercial law, introduced as a postgraduate course at the University of Oxford in 1995, was taught at a relatively small number of law schools. Since then the subject has blossomed and is now taught at law schools around the world. 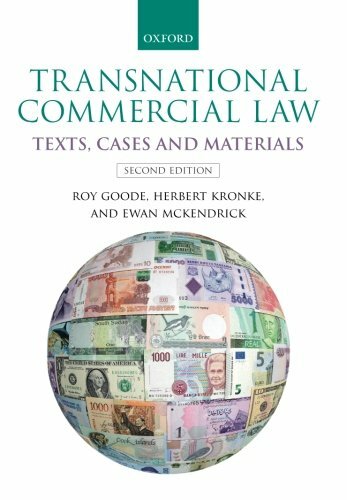 Focused on the products and processes of the harmonization of law relating to international commercial transactions, the book is an invaluable resource for students in this field. In this new edition the work has been completely revised and updated, covering a number of new or substantially revised international instruments. In addition four new chapters have been added by specialist contributors dealing with regional harmonization, carriage of goods by sea, transactions in securities and the relationship between international conventions and national law. The authority of the text is enhanced by the fact that all the authors have played leading roles in the drafting and development of many of the instruments examined in the work. About: When the first edition of this student work was published some eight years ago transnational commercial law, introduced as a postgraduate course at the University of Oxford in 1995, was taught at a relatively small number of law schools.